Today is World Nutella Day — a day dedicated to celebrating the absolutely divine delicious hazelnut-chocolate spread. 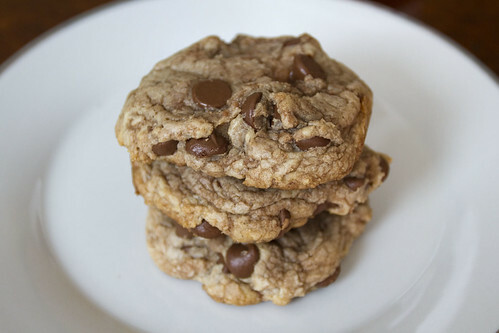 Swirls of that chocolatey goodness compliment the chocolate chips in these chewy cookies — not as good as licking Nutella directly from the spoon, but man is it close. Preheat oven to 375 degrees. Whisk together the flour, baking soda and salt. Set aside. Cream the butter, granulated sugar and brown sugar with an electric mixer. Add in the eggs and vanilla and mix well. Slowly add the flour mixture to the batter, mixing well after each addition. 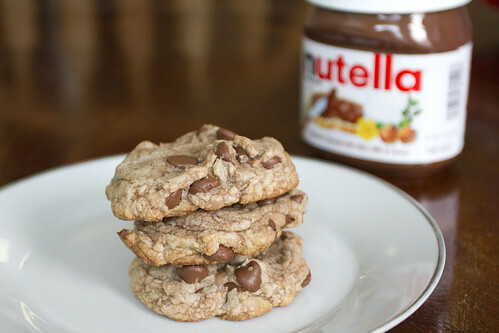 Add the Nutella and mix briefly, swirling the Nutella throughout the dough. Stir in the chocolate chips. Drop the dough by the tablespoon onto prepared baking sheets. Bake for 8-10 minutes until the bottoms of the cookies have just started to turn brown. Allow to cool for 2 minutes on the baking sheets, then transfer to wire racks to cool completely. 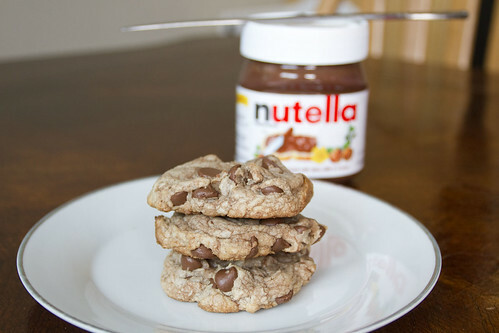 What’s your favorite way to eat Nutella?